A few of my non-Mormon Sister Wives and I decided to have breakfast and go see the new ENTOURAGE movie today. In a rare twist of fate, this was our second Sister Wives adventure this week, the first being a paradise pool party on Tuesday, a few doors down from Donnie Wahlberg and Jenny McCarthy’s new abode in the Chicago suburbs. This adventure didn’t end well for one of our Sister Wives…who awoke on a poolside chaise lounge at 9:30 p.m. in a Chardonnay-induced haze and is likely just now eating solid foods again. I hope the new neighbors weren’t offended that we blasted Marky Mark’s “Good Vibrations” vs. Donnie’s vintage croons. Towards the end of breakfast, four of us Sister Wives were deep into a conversation about botox when a stranger in her late 40s to mid 50s–we are still debating her age–approached our table with a 6-month-old in a baby carrier. She looked at my friend Ophelia (we think so, anyway–we’re still puzzling over whom she was actually addressing) and said, “Do you want to see Baby Bentley, too?” We all looked up, with our collectively confused, WTF facial expressions. Did we know this woman? And why was she was foisting her baby on us? “He’s my sister’s twin baby,” she continued, by way of some nutty, non sequitur explanation. “There’s another one just like him,” she added. And then she abruptly walked away, baby carrier in hand, off to pay her bill. Once she was out of earshot, the table erupted into a mad scramble of a debate, trying to figure out who among us knew her. None of us did. Since I’m the freak magnet who attracts every Gary Busey-type within a 10-mile radius without even trying, and Ophelia is my rare equal in this odd magnetism trait I’ve grown to accept over the years, we’re doubly charismatic-dangerous when we’re together. A reality TV show with Ophelia, me, and Gary Busey would be something to watch, I assure you. Of course my writer’s mind goes into overdrive, building a tale where this woman’s a child trafficker who dresses up like a nurse and grabs newborns from the local hospital. She did have crazy eyes, maybe just a little bit. SO NOT me, or Sister Wife C, either. “Apparently my baby repellant is no longer working,” snarked Sister Wife C. I burst out laughing. She and I are so on the same page about this. We aren’t proud to admit it, but we deplored that whole baby mama stage of life. 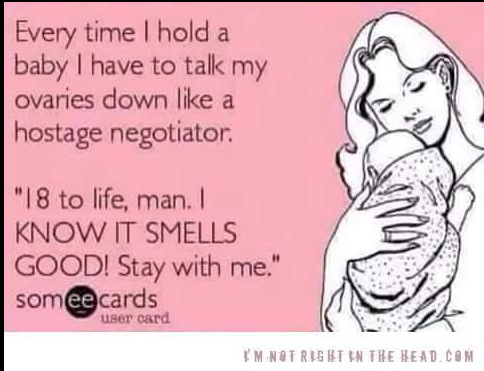 I’m probably the only person I know who doesn’t relish the smell of new babies. They always smell like oily hair to me, which is not a smell I enjoy. Neither is that sickening sweet baby powder smell. I never used it on Jack for that reason. Jack barely makes it out of the shower with his noxious AXE hair products and I’m already smelling oily hair on him and sending him back in for a second try. The whole baby mama thing didn’t get fun for me until Jack was probably about 1 and could walk and talk a little. Prior to that, he had his flashes of genius, but mostly, I was impatient for the next phase and bored, bored, bored. There are only so many cute moments to make up for All. That. Poop.